The digital enterprise is increasingly a mobile enterprise. Business users and customers are showing a sharp interest in mobile devices and mobile applications. 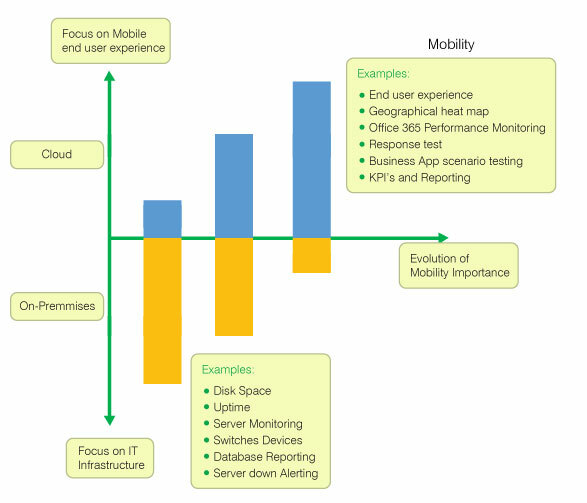 The future of enterprise applications, both for enterprise workers and consumers, is mobility. Mobile user experiences will become more diverse and more sophisticated; CIOs and Administrators responsible for mobile operations must become more aware of new mobile experience approaches and technologies. VitalSigns is the right solution to help them deliver a good experience for the Business users. Pro-active Monitoring, end user experience reporting and KPI’s are keywords here. Whether you have a complete IBM Domino system on-premises or a full Office365 Cloud strategy, VitalSigns delivers the methodologies to report on End-User experience, reduce down time and improve the reputation of mobility in general. VitalSigns helps you understand the diverse variety of devices that your users bring to the office. What is the most popular device? Which users have multiple devices? What percentage of devices have synchronized within the last 30 minutes? VitalSigns helps you answer these questions and more. Last but not least, by having true insight in the end user experience in the mobile world, VitalSigns can help customers reduce costs and build a stronger TCO for their mobility strategy.